Good news, art/transport fans! 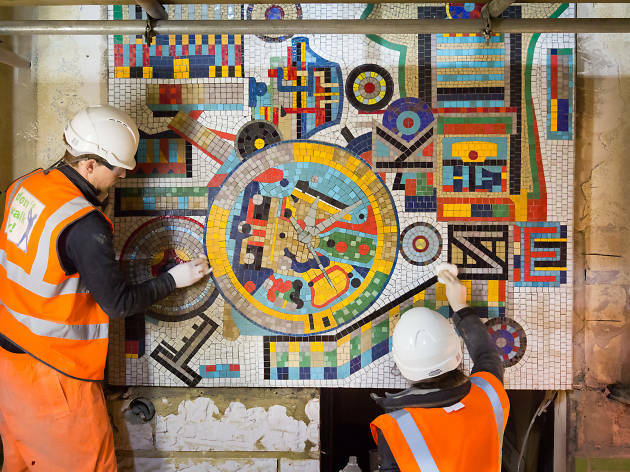 It's been announced this week that the final stages of the Eduardo Paolozzi mosaic restoration process have been completed. 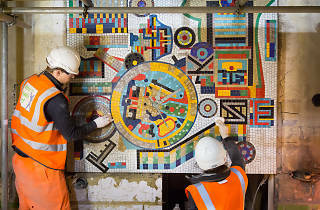 Around 95 percent of the mosaics at Tottenham Court Road station finished by the artist in 1986 were retained, using original tiles where possible during the restoration, and closely colour-matched new ones where necessary. The public artwork had to be relocated because of the modernisation of the station, which is currently preparing for the addition of the Elizabeth line in 2018. Now at 150,000, the number of people using the station is estimated to increase to 200,000 per day. One of the final, mammoth tasks involved in the project included moving a panel from the former Oxford Street entrance to its new home at platform level. The arch sections that couldn’t be shimmied down a life shaft and re-homed within the station now live in the Edinburgh College of Art where Paolozzi studied and later tutored. This month, former students and conservation specialists will meet to discuss how it can be reconstructed into a new piece of public art. The news will be welcomed by the thousands who signed a petition back in 2015 when the mosaics were thought to be under threat, and the many Londoners whose commute they brighten every day.